The B979 Netherley Road is due to close from around 8pm tonight (Friday) until 6am on Monday (January 15) as part of the AWPR project. It is to allow realignment of the A90 northbound slip roads and surfacing work as construction continues on the new roundabout. People heading north from Stonehaven should travel via the B979 David Street, Allardice Street and then the A957 Bridgefield, Dunnottar Avenue up to Glasslaw Junction. They should then turn right onto the A92, known locally as the Coast Road. which leads to the A90. 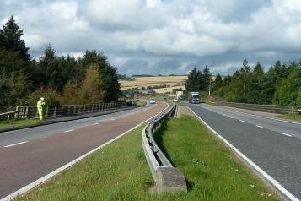 Motorists heading south into Stonehaven on the B979 Netherley Road should turn left at B979 Mains of Ury to join the A90 heading north towards Aberdeen. They should then leave the A90 at the Newtonhill flyover junction and re-join the A90 heading south, taking the first exit to Stonehaven, U90K Den of Logie Road. Access to the A90 via the new southbound slip road will be available from Stonehaven during the closures. However, drivers access ing the A90 southbound from the B979 north of the closure should follow the diversion.